Algopix is a product and market research platform that allows online sellers to make smarter business decisions about their inventory and the way they choose new products. On top of this, it analyzes data from across three major marketplaces and eight different countries, helping sellers expand into different international markets. The software provides data in real-time through an algorithm that tracks millions of different products. Merchants can really cement their positioning in their market through competitor analysis and a unique recommendation system. This essentially lets sellers know if a product is worth investing in, by analyzing its monthly sales, price point, seller fees, and revenue. What’s the story behind Algopix? 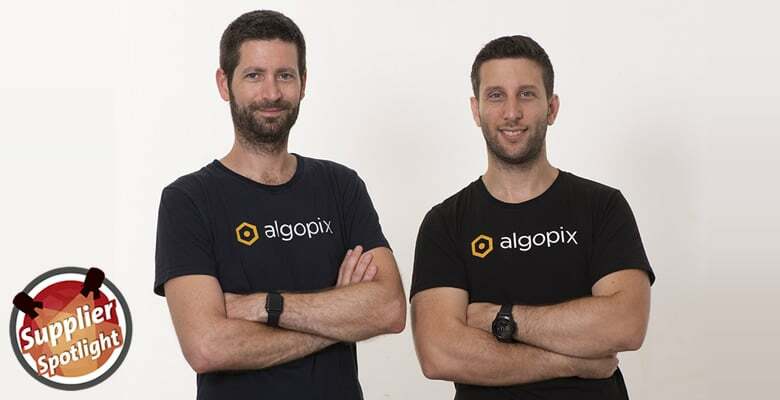 Founded by Ori Greenberg and Dani Avitz in 2016, Algopix has an extensive backstory in the ecommerce world. Before Algopix was even a glint in the eyes of the founders, Ori and Dani ran an ecommerce agency that worked with third party retailers looking to move their businesses online. The duo provided services and solutions around marketing, technology, and logistics, but soon realized that the majority of their customers suffered from what’s known as “dead inventory”. This is basically an excess of products that can’t be sold for one reason or another. Maybe they’ve gone out of fashion, are no longer relevant, or there’s simply too much competition. Ori and Dani investigated further and found that almost a quarter of retailers (both online and offline) had serious problems with overstock. Dead inventory is a huge problem for sellers. Through the agency, Ori and Dani began to help their customers improve buying decisions, using their experience to analyze more than 10,000 products and pick out the bestselling 300-400 at a time. The service was a success, taking customers’ average overstock from 20% down to 7% and saving them a ton of money. Because of this success, and its clear benefit to retailers, Ori and Dani decided to start Algopix to focus solely on helping businesses make better inventory buying decisions. How does Algopix identify products? Just like people, products have several different identifiers. Where we have our names, passport number, social security number, and more, products have EAN, UPC, MPN and so on. Algopix uses these identifiers to gather and maintain accurate data for each and every product. On eBay, however, each seller creates their own listing and the use of product identifiers is not consistent, so it’s much harder to match products. Algopix uses an AI algorithm to supplement the use of product identifiers on the eBay marketplace. What key features does Algopix have? Sales estimator: Algopix estimates monthly sales volume and gross merchandise volume (GMV) for any product on Amazon. This not only allows sellers to make more informed products-sourcing decisions, resulting in increased sales volume and less overstock but also reduces the risk when expanding internationally. 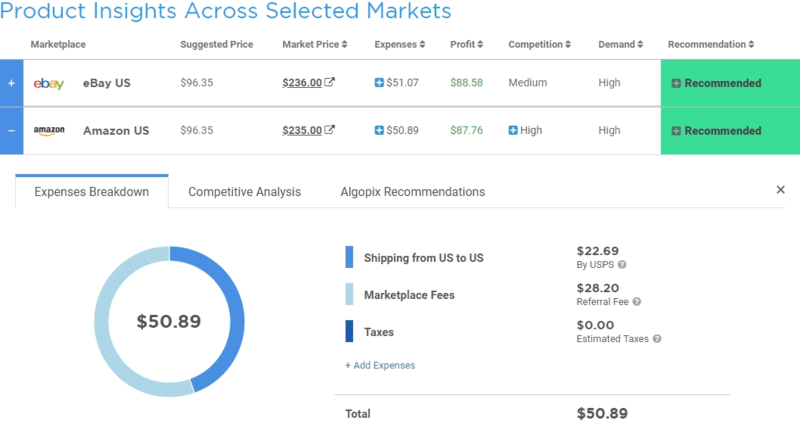 Expense analysis: Algopix provides a detailed analysis of FBA costs, shipping fees, marketplace fees, and taxes for each market of interest. Using this information, Amazon sellers can better understand the impact on their bottom line and monthly profit. Competition analysis: Algopix provides essential data about the competitive landscape so sellers will get to know their competition and decide whether to compete or allocate their resources for different products. Google AdWords insights: Algopix Google AdWords analysis provides a recommended search phrase, average cost-per-click, competition level and estimated cost-per-acquisition for the recommended phrase. Bulk analysis, which allows sellers to upload large files of products for quick analysis. There are sellers who want to analyze thousands or even tens of thousands of products per month. Using Algopix, they can simply choose which markets they want to analyze, upload their product file, and get a full report to their inbox. API access that enables online sellers to dramatically scale their decision-making by providing continuous access to essential real-time data, such as sales information, product information, competitor analysis and much more. The Best-Sellers plan, which provides sellers with a daily list of the top 50 best-selling products in their industry. What kind of sellers use Algopix? Originally, Algopix was created specifically for sellers who already had an established online business. Today, the user base is much broader, including both newbies who are interested in building up their product range, medium-sized sellers whose monthly sales are in the five-figure range, and huge companies that make use of the API to research millions of dollars of stock each month. At the last count, there were over 30,000 online sellers using Algopix. Resellers and distributors who want to avoid buying blind. They tend to get price lists from different suppliers and run them through the Algopix platform to get more detailed data about each product. Manufacturers, who use the tool to carry out competitor analysis and determine which products are performing well in their industry. Brands, who are particularly sensitive to the price their products are being sold for, so use Algopix to discover any rogue retailers selling their products too cheaply. Can Algopix be used through a browser extension? Yes. As well as the new API feature, Algopix has recently launched a Chrome Extension. Once the user has installed the extension, they can pull up information on any Amazon, eBay or Walmart product listing. After clicking the “analyze” button, it shows all the relevant data about the product, including its pricing and sales history, bestseller rank, and more. What makes Algopix different to other services? Accuracy is the name of the game for Algopix, and the data gathered is in real-time and precise, providing sellers with instant, up-to-date information they can use right away. Algopix allows sellers to analyze products on Amazon, eBay and Walmart, across eight different countries, with just one click. Other product research tools only cover one marketplace. Algopix includes a breakdown of expenses (like taxes, shipping, and marketplace fees) to provide a full view of potential costs and revenues. Finally, sales estimates are a unique feature. Understanding product sales performance is great for both new product research, and for sellers assessing the value of new sales channels at home and abroad. How do sellers get started with Algopix? There is a free 7-day trial where users can get a feel for the features provided and start to analyze products. No credit card is required to take the trial. There is no need to connect the software to your Amazon or eBay account, so the sign-up process is very straightforward. Ori and Dani are all about surprising their community with new features, and they have been working hard on an inventory exchange that will help connect sellers and buyers from different markets and different countries. So, when sellers do have overstock, they can more easily find other businesses to sell it to, in bulk. On top of that, improving the market research experience is also on the horizon. The plan is to make the process much more accessible for users and to start disrupting the way online sellers do product and market research. Sellers will also be able to analyze bigger data files and receive the 50 daily best-sellers for specific niches, to get a laser-focused insight into their industry. You can find out more about the latest updates and current research on the Algopix blog. Product selection can make or break an ecommerce business. Get it right, and you can see huge success. But, if you make too many bad decisions, you can end up with inventory that drains your business of cash and resources. Algopix takes the guesswork out of market research so that sellers can make educated decisions on which products will sell well and – just as importantly – which ones should be avoided at all costs. This post was sponsored by Algopix.